A healthy diet doesn't mean depriving yourself from everything you love on your plate. Although I am not a huge fan of turning every classic dish into a healthy one (some things are truly irreplaceable and better consumed as they are), but when it comes to brownies, I just can't let plain flour and refined sugar get in my way! This is probably the best dessert ever (chocolate, I know), and I've seen hundreds of lovely re-interpretations, but how about a really moist, coconut-flavored vegan brownie? Coconut flour can do magic for gluten-free brownies and tastes amazing. Basically it is the dried coconut flesh ground into a fine flour, which is packed with all the nutrients in coconut, in a concentrated form. Coconut flour offers both fiber and protein, and its fats has anti-inflammatory and anti-viral effects. What can you ask more from a flour? When it comes to chocolate, I have to say that you don't have any reason to stay away from it, as long as you check its ingredients. Make sure that it only contains nourishing ingredients that help keep your healthy diet rather than hijack it. Simple ingredients, as minimally processed as possible, make it easy to keep your favorite foods in your diet. 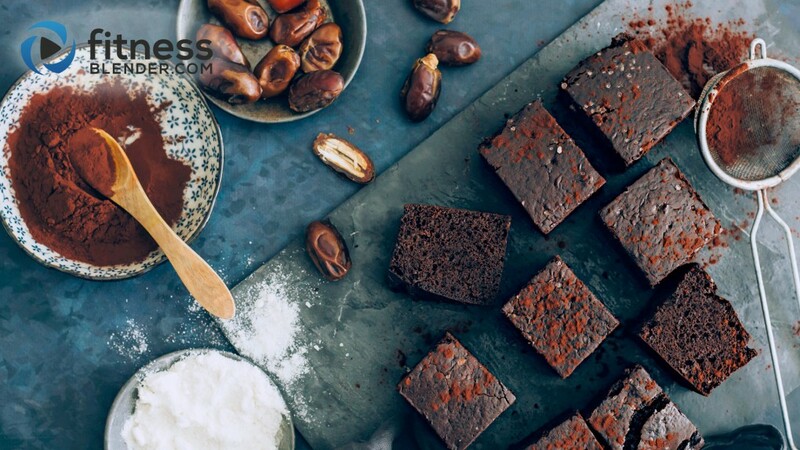 One of the key ingredients in these vegan brownies are the dried dates. Mediterranean cultures love these fruits, because of their natural sugars, their fiber, antioxidants and their high concentrations of potassium, the essential mineral that keeps your sodium levels in check and help your cells pump excess water, toxins and sodium overload. I always use a date puree to replace sugars in my baked goods, and the taste and flavors they give them is just amazing! If you are looking for an alternative to coconut flour, you can use buckwheat flour, with a nutty-flavored taste or almond meal. Both of them are great gluten-free alternatives to plain flour. In a medium sauce pan add the coconut milk and coconut oil and bring to boil over low heat. Add the chocolate and stir to melt and incorporate. Remove from the heat and add the raw cacao powder, coconut flour, tapioca starch, baking powder, baking soda and flax, mix to incorporate and set aside for 10 minutes. In a food processor add the soaked dates and pulse to obtain a fine puree. Incorporate the puree into the chocolate batter. Transfer the batter into a greased pan and bake for 20 minutes. Remove from the oven and and set aside to cool before slicing.